Environmental impacts of dams can be both adverse and beneficial. Dams have intended and unintended impacts, though positive impacts can be both intended and unintended. 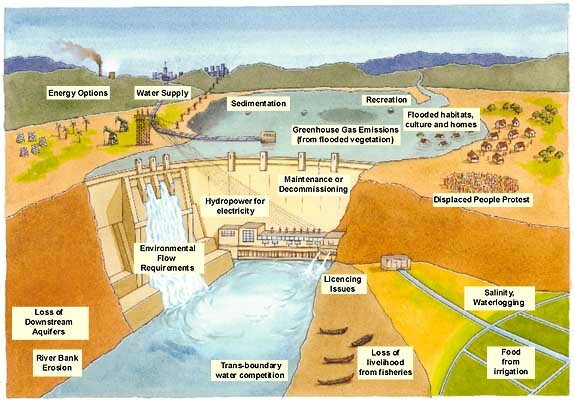 Each of these types of impacts of dams can be inevitable in their entirety, reducible or totally avoidable. Most adverse social and environmental impacts of dams were, till recently, ignored. Even now, such impacts are only partly reflected in the project’s financial and economic analyses. While a financial analysis might reflect the direct costs of reforestation, catchment area treatment or of relocating and rehabilitating project affected persons (PAPs), many other costs remain unacknowledged. Also, many of the environmental and social costs do not lend themselves easily to financial quantification. Social impacts are the overarching impacts; all economic and environmental impacts also have social impacts. However, whereas economic impacts can all be seen as having essentially social impacts, environmental impacts affect not only human society but also other elements of nature. For most recent projects, the environmental clearance conditions include treatment of the catchment area. Where this treatment is adequately undertaken and results in the regeneration of natural forests and other ecosystems in the catchment area, there are significant benefits to the environment. The creation of a reservoir provides a habitat for wetland species, especially water birds. The reservoir can also be a source of water to animals and plants in the adjoining areas and, where such areas have become unnaturally dry, this can be a significant environmental benefit. These benefits were not included in the cost-benefit analysis for any of the projects studied. The construction of a dam itself can contribute to the degradation of its catchment. For example, extraction of cooking fuel by the labor force and improved access to the forests, both during and after dam construction, degrades catchment forests. The construction of roads and other infrastructure and the enhanced activities in the area also put an additional pressure on the forests. This results in greater silt flows into the reservoir, thereby reducing the life of the dam and also posing a threat to its safety and to its equipment and machinery. Degraded catchments also result in erratic water flows resulting not only in dry season shortages but also a surplus during heavy rainfall and cloudbursts, threatening the safety of the dam. The degradation of the catchments also adversely affects the biodiversity value and other ecological functions of the forests upstream. After construction, where forests are submerged under the reservoir, the pressures on the remaining forests, mostly in the catchments, go up significantly. Also, where catchments get degraded, the local community’s access to biomass is adversely affected. This often results in further degradation. One common prescription to avoid the negative impacts of dams on the catchment and of degraded catchments on dams is the carrying out Catchment Area Treatment (CAT). However, there are many problems with the current system of CAT. The major activity under CAT ought to be extensive plantation and regeneration of vegetative cover. In order to ensure that trees survive and regeneration takes place, the factors that have led to the degradation of the catchment in the first place need to be minimized. For this to be successful, local communities must be involved. However, this almost never happens. Consequently, even where treated, the catchments rapidly deteriorate. To be effective, the treatment of catchments must be completed prior to impoundment. Unfortunately, this does not happen and the considerable amount of silt thrown up by the treatment process itself along with that emanating from as yet untreated catchments, gets deposited in the reservoir. In recent times, there has been an increasing tendency to treat only the ‘directly draining’ reservoir, a scientifically absurd concept, as against the entire catchment that is ‘highly degraded’. Much of the catchment requiring treatment can be private land, where treatment can only work if the owners cooperate. However, most schemes do not cater for this. The soil, stones and sand required for the construction of dams and canals are often mined and quarried from around the dam or canal site. Such extraction can also have adverse environmental impacts, especially by aggravating dust pollution, disturbing wildlife and destroying vegetation. The scars and pits that such mining and quarrying leave (sometimes called borrow pits) remain as ecological sores and can also have an adverse impact on the dam and the canals. When a free-flowing river meets the relatively static reservoir, there is a build-up of back-pressure and a resultant backwater. This can destroy the upstream ecology and cause damage to property. Backwaters can also build up due to the deposition of sediments and silt upstream of the reservoir as ‘backwater deposits’. Construction activities, including the diversion of the river through a tunnel, have major adverse impacts on the aquatic ecosystem. Vulnerable species, with either limited distribution or low tolerance, could become extinct even before the dam is completed. The blocking of a river and the formation of a lake significantly alters the ecological conditions of the river, adversely impacting species and the ecosystem. There are changes in pressure, temperature, oxygen levels and even in the chemical and physical characteristics of the water. Besides, by interrupting the flow of water, ecological continuity is broken. This is most obvious in the case of those species of fish whose passage up to their breeding grounds is blocked by the dam. However, many other species get affected, though not as dramatically. The disturbance caused by construction activities, including noise and movement, building of roads, extraction of stone and soil, construction of buildings, etc. also negatively impact the fauna and flora at the dam site. As impoundment starts, the reservoir invariably submerges large tracts of forests and other ecosystems, including grasslands and wetlands. Data was available on forest submergence for 60 dams. Based on these, the average forest area submerged per dam works out to approximately 4,879 ha. Therefore, the 1,877 dams built between 1980 and 2000 would have submerged 9,157,883 ha. (roughly 9.1 million ha.) of forests. The CWC has stated that, according to a study of 116 projects (details not available), the average forest submergence per project was 2,400 ha. Even if we take this to be the correct figure, the total submergence between 1980 and 2000 would have been 4,504,800 ha. (roughly four and a half million hectares). The most common mitigative measure prescribed is compensatory afforestation. However, available evidence indicates that “compensatory” afforestation is difficult to implement, and in some cases was not complete many years after completion of the project. According to the Ministry of Environment and Forests, the performance of state governments in compensatory afforestation has not been very satisfactory. Till 1997, only 46% of the area stipulated to be afforested had even been taken up. Also, it is impossible to replace a natural forest by a plantation. Therefore, even if there is formal ‘compensation’ for the forests lost in terms of forest area, the actual ecological and biodiversity losses that the destruction of natural forests imply cannot be compensated. Apart from forests, the reservoir and the dam also affect other ecosystems and various fauna and flora species. Unfortunately, till recently, there was little effort to assess the impact on flora and fauna and on non-forest ecosystems. Even where studies were conducted, there was a tendency to consider only large mammals as ‘wildlife’. Recommended mitigation included the creation of bridges for the movement of elephants (Dalma-Subernarekha Project) and the creation of sanctuaries (Sardar Sarovar). In some cases it was suggested that there would be no impact on wildlife as they would migrate to neighboring forests. For example, a study done on the impact of the Indira (Narmada) Sagar project on wildlife, by EPCO in Madhya Pradesh, suggested that the wildlife would either voluntarily migrate into neighboring forests when impoundment took place or could be driven there by squads of specially trained staff. Similarly, studies done in relation to the Tehri project maintained that the fish would migrate and establish themselves upstream of the dam. For the Rajghat project, it was suggested: “The national park at Shivpuri is not far off. But do the animals and birds know this? And the areas where these animals would hopefully move into are not ‘vacant habitats’ available for occupation by displaced animals. They have their own complement of wildlife. Besides, wild animals are rightly wary of leaving their own territory and panic when waters flood in. Some animals are nocturnal, others roam around during the day; they live underground or on trees and in caves. And what about plants and insects and reptiles and micro-organisms, which also constitute wildlife? Reservoirs also submerge productive agricultural land in the valley. This not only has a social and economic cost but also adversely affects cultivated biodiversity and a host of birds, insects, mammals and reptiles that have adapted to agricultural ecosystems. In many cases, traditional crop varieties and methods of cultivation disappear because of dams. For reservoirs in the tropical regions of the world, especially those that are below 1,000 m. elevation, there is a significant threat of vector breeding. Mosquitoes, which are carriers of malaria, filaria, dengue and other diseases breed in small pools of water created on the edges of the reservoir due to the lowering and raising of the water level of the reservoir. In some areas, snails, which are carriers of schistosomiasis, are also found to proliferate because of dams. The correlation between the spread of vector-borne diseases such as malaria and irrigation projects has been well studied and established. In various projects, for example Sriramsagar and Ukai, the incidence of malaria reportedly increased after impoundment. Raichur district in Karnataka became highly endemic for malaria after the construction of the Tungabhadra dam and its canal network. In the Sirhind feeder canal command area, there was a “menacing increase in mosquitoes”. Further, fluorosis was also noticed in Nagarjunasagar. Genu valgum, a crippling bone disease associated with skeletal fluorosis, developed in young people, especially males. The setting up of primary health centers and the spraying of pesticides are the two most common responses to the threat to human health. Unfortunately, the first is a curative rather than a preventive measure. Also, the effectiveness of pesticides is doubtful. Besides, the application of chemical pesticides results in other health hazards, which also need to be assessed and tackled. New agricultural practices, many of which are a consequence of the irrigation waters brought in by dams, also promote the use of chemical pesticides and fertilizers. These have well recorded and significant adverse impacts on the environment and on human health. However, though the benefits of the anticipated increases in agricultural productivity are taken as a benefit of dams, the resultant costs of pesticides and fertilizers on the environment are very rarely computed or even studied. The weight of the reservoir, by itself or in conjunction with other reservoirs in the region, can create the sorts of pressures that could result in an earthquake. The weight of the reservoir can also force water down cracks and faults till it catalyzes an earthquake. The occurrence of reservoir-induced seismicity is now a well-accepted fact. RIS has occurred in various dams across the world. 17 of the 75 cases of RIS reported worldwide have been reported from India. Canals themselves can directly contribute to waterlogging. If not properly lined, or maintained, significant amounts of water can seep out of canals and inundate the lands around. Also, when subsidiary canals are not well maintained, when the releases of water are not properly monitored, or when drainage is not assured, waterlogging results. Waterlogging not only reduces the anticipated agricultural benefits from irrigation projects but sometimes reduces them to levels below those prior to irrigation. A well known and documented case is that of the Tawa dam in Madhya Pradesh. Waterlogging can also be one of the causes of salinity and provide a conducive habitat for vector breeding. It destroys natural vegetation, damages houses, buildings and roads. Canals also interfere with natural drainage across a slope and thereby lead to waterlogging on the up-slope of the canal where the water collects, and aridity on the down-slope. Very often corridors have to be cut through forests and other natural ecosystems to accommodate power lines. This adversely affects the terrestrial ecosystems. These corridors also have to be maintained in order to allow repair and upgradation work on power lines, causing a long-term impact. In the Uri project, for example, 98.54 ha. of forestland was given clearance for transmission lines in Jammu and Kashmir. In the ongoing Tehri project, power lines are not only resulting in the felling of a large number of trees in the Himalayas but are also passing through the Rajaji National Park. Power lines, especially high-tension lines, are also known to produce high levels of radiation, affecting ecosystems and human beings. High-tension power lines can also cause fires and be hazardous to birds and animals. By interfering with river flows, dams adversely affect downstream flora and fauna. There is a popular misconception that as dams supplement dry season flows and only partially curtail rainy season flows, their impact downstream is negligible or even, sometimes, positive. In fact, riverine ecology needs heavy rainy season flows as it is during this time that many fish species breed. By curtailing the rainy season flow, the dam inhibits the ability of the ecosystem to regenerate itself. Heavy monsoon flow also acts as a flush for the riverbed and river mouth, clearing them of accumulated silt, garbage and stale water. The absence of such a flow creates significant problems downstream and decreases the capacity of the riverbed to accommodate peak flows, leading to larger floods in the case of cloudbursts or sudden releases of water. In many irrigation projects, a significant amount of water is diverted from the river and transported out by canals. This results in significant shortfalls in the natural flow and in the net flow of water in the river. There are, again, serious ecological implications of this. A large proportion of the nutrients that flow down the river and form an essential part of the food-chain of the river’s ecosystem get trapped by the dam thereby starving the ecosystem. Certain species of fish must travel upstream to breed. The recent tendency to set up breeding centers for such fish might ensure the availability of these fish downstream but does not compensate for the ecological roles that these fish species played in the riverine ecosystem upstream of the dam. Post-construction effects can also have a negative impact on coastal and marine ecosystems, especially as the depletion of nutrients result in an insufficiency of food for various marine species. In other cases, reduced flows can lead to the erosion of estuaries and coasts. Often sites for rehabilitating the PAPs are carved out of forest areas or from other ecologically valuable areas. Also, when large human populations are shifted to new locations, there is often serious adverse impact on the neighboring environment. This is accentuated if adequate resources have not been planned for and made available to meet the water, land, fuelwood and fodder needs of these populations. Forests and other natural resources are also sometimes degraded because a lack of other livelihood options force the affected people to earn their living by extracting firewood and fodder at an unsustainable rate. Many examples of this are available. In Nagarjun Sagar, 14,000 ha. of reserved forest was identified for rehabilitation. In Sriramsagar, compensatory afforestation was reported to be less than what was diverted for rehabilitation. Forestland was also diverted for rehabilitating PAPs of the Sardar Sarovar project. The variation and reduction in water flow in the river adversely affects water availability downstream, both from surface sources and because of inadequate recharging of groundwater. Diversion of water into canals also results in less water downstream, affecting ground and surface water resources. Pollution: Reduction and variation in the flow of the river also results in the increased concentration of pollutants downstream, during dry seasons. Saltwater ingress: Where the quantity and force of water reaching the river mouth and flowing to the sea is reduced, there is a danger of saltwater ingress. Such ingress can not only destroy riverine and terrestrial ecosystems but can also contaminate groundwater resources. Degraded catchments, excessive rainfall or over-filling of reservoirs, may make it necessary to suddenly release large quantities of water from the reservoir in order to protect the dam structure. Such sudden releases can be disastrous for people living downstream, for their crops and for entire ecosystems. Reportedly, such releases occurred twice from the famous Bhakra dam, in the late 1970s and again in 1988. Another case was that of the Rihand dam. In 1997, huge amounts of water were suddenly released and flooded 175 villages in Rewa district of Madhya Pradesh as well as Rewa town, killing 14 people and causing an estimated damage of Rs. 200 crores. The failure of the dam, where the structure collapses and allows the reservoir to partially or totally drain out, is a catastrophe for downstream ecosystems and human populations. There are many causes of dam failure. It can be due to faulty design or construction, use of substandard materials, overtopping due to surplus water, deliberate sabotage or bombing or because of severe earthquakes. In some cases, whereas the dam structure might remain intact, the neighbouring hillsides crumble having the same effect as the dam collapsing. According to the World Bank, in the case of the Machhu dam-II, “The initial design flood capacity of the spillway was 200,000 cusecs based on an estimated PMF of 191,000 cusecs. However in August 1979, the dam was overtopped by a flood of 460,000 cusecs. Following this, a complete review of the hydrology was conducted, which led to a revised PMF estimated at around 739,000 cusecs, which was nearly four times the original design flood. Similar fears are being widely expressed about the Tehri dam. According to a presentation made by the MoEF to the Prime Minister of India, if the Tehri dam burst, in less than an hour and a half, the water would hit Rishikesh and Haridwar and wipe out these two cities.